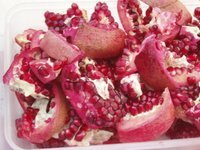 Last winter when the pomegranate season was about over, I posted an ode to the "seeds of my heart" all about pomegranate lore and wrangling (including how to get the seeds out without much mess). Then I posted some links to pomegranate recipes elsewhere on the web. You can check those out here. But I also got some other pomegranate recipes emailed to me. By the time I got around to dealing with them, however, pomegranates had disappeared from the stores. Well, the "Sherman tank" of fruits is back in the produce section and I thought I would share these resources now. Derrick did this roundup on pomegranates for sfist. Barbara of Tiger and Strawberries did an Indian stir fry she called "jeweled chicken." McAuliflower has a treasure trove of pomegranate recipes on her site Brownie Points. 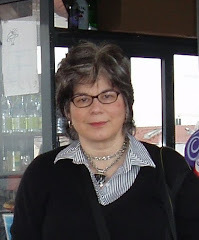 Click on over and check out her archives. For something different, try making her "pucker up pomegranate truffles" . Lynette of Lex Culinara made the most gorgeous baby pavlovas, a perfect balance between sweet meringue and tart pomegranate seeds. If you'd like to add a link to your favorite pomegranate recipe, please leave it in the comments section below. And I thought pomegranates were under valued! Very nice blog!